An upgraded tool kit with three essential hand tools that store in a handy trifold canvas pouch for all types of wire and cable preparation and repairs is being introduced by Xuron Corp. of Saco, Maine. The Xuron® TK2300 Wire Harness Tool Kit features the three tools used most for assembly and field service wiring applications all packed into a handy trifold canvas pouch that fits into a tool kit or pocket. 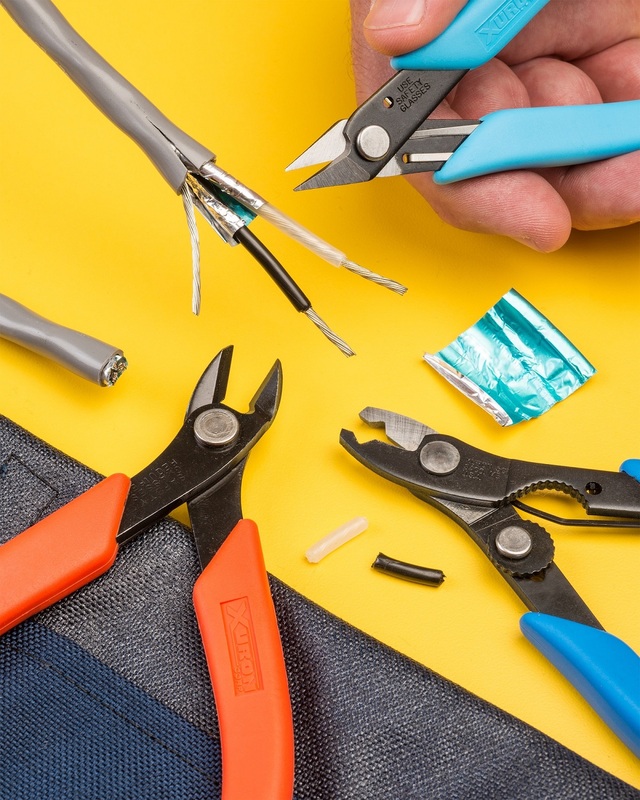 Included is the Model 440 precision scissor for slitting coaxial cable jacketing and cutting foil insulation, Model 2175 Maxi-Shear™ flush cutter for wire up to 12 AWG, and the Model 501 thumb adjustable wire stripper-cutter for 10 to 26 AWG. Suited for professionals who need to assemble, install, or repair wire and cable in a facility or in the field, each tool in the Xuron® TK2300 Wire Harness Tool Kit is ergonomically designed with soft rubber hand grips, no finger loops, a Light Touch™ return spring, and a non-glare black finish. The canvas pouch has pockets for each tool and a hook & loop closure. The Xuron® TK2300 Wire Harness Tool Kit is priced at $ 56.95 (list).